Lori McKenna made her name at venues like Passim. Now she's on the big stage, opening for Faith Hill and Tim McGraw. 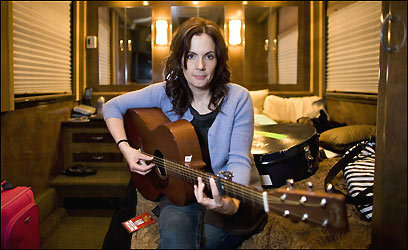 Lori McKenna is in a full car whizzing down a stretch of nondescript highway at 11 a.m. on her way to run errands. She chats amiably about a friend's new dog, recent celebrity gossip, and her oldest son's plans for the future. It could be any day in the life of this Stoughton mother of five, until the Space Needle comes into view and someone in the car asks the driver to tune to a local Seattle radio station to see if they are pimping McKenna's imminent arrival. "Did you just say pimping?" McKenna asks with a laugh. McKenna is a longtime and well-liked fixture of the Boston singer-songwriter scene. It could be any day in her life, but it's not. It is the sixth date of the "Soul2Soul 2007" tour, a continuation of the highest-grossing country music tour in history thanks to its two titular souls, multiplatinum superstars Tim McGraw and Faith Hill. McKenna is the opening act. "All the places we're going on this tour, I've never been before," says McKenna from the back seat of a gold SUV piloted by her publicist. "I've never been away from home more than four days," she adds. Her ice-blue eyes are filled with excitement; her slight frame makes it impossible to believe that she is 38 and the mother of one child, much less five, ages 3 to 18. McKenna can now count Hill and McGraw as friends. Hill covered three of McKenna's songs on her multiplatinum 2005 album, "Fireflies," and McGraw signed her up to his new label. Thanks to their support, McKenna will be able to check off quite a list of things she's never done before by the time she wraps up her stint with two hometown shows at the TD Banknorth Garden on July 5 and 6. She will have traveled with backing musicians Mark Erelli and Russell Chudnofsky on a spiffy tour bus with shiny gold-and-black interior that recently ferried Ricky Martin about and is the coach of choice for Kris Kristofferson. "We're focusing on Kris Kristofferson," she says with a laugh. "I tried to explain to the babies because they sleep in the bed with me every night: 'This is Kris Kristofferson's bus!' And they're like , whatever," she says of 5-year-old Megan and 3-year-old David, who are along for the ride. Earning his keep, her 18-year-old son Brian is serving as a roadie for his mom. She will become an expert text messager and master of video chat, which she uses to stay in touch with Gene, her husband of 19 years, and sons Mark, 15, and Christopher, 13, who are still in school. "David just hugs the whole computer screen [when we talk to them], it's the cutest thing." And she will experience the most unexpected benefit of big-time touring, the catering. She cracks up when recalling Erelli's disbelief at the lavish spread: "Hearts of palm! Who tours with hearts of palm?" Tonight she will take the stage at the cavernous Tacoma Dome, but before that she has radio and TV appearances to make. At noon, in a conference room at radio station KMTT, McKenna, Chudnofsky, and Erelli perform a short set for the staff, which has been lured in by music and a free lunch. While tuning her guitar between songs, McKenna marvels at the lovely view of downtown Seattle and Puget Sound. "I write a lot of songs about running away and drinking. Occasionally I have to write one to reassure the kids," she jokes, then launches into the jaunty "Witness to Your Life," a near-happily-ever-after song about her marriage. Several heads in the room bob along between bites. McKenna and the band are then led to a nearby studio to record a live version of "Unglamorous," the title track to her forthcoming album, coproduced by McGraw and out Aug. 14, for possible future use on the air. "Unglamorous" isn't just a song, however. It sums up McKenna's life. She worked part-time at her brother's glue factory in Easton for 15 years while popping out kids (she had her first at age 20) with Gene, a plumber for Bay State Gas. She began playing at age 14 -- inspired by artists like James Taylor and Bruce Springsteen -- but didn't perform live until age 27, touring in the same old minivan she uses to go to IKEA and check out new releases at Target. And her songs are richly detailed ruminations on that everyday life. McKenna is unflappable, unself-conscious, and unassuming, traits that stem from having five kids to manage, growing up in a large Irish-Catholic family -- four older brothers and a sister -- and the loss of her mom when she was just 7. She tackles that topic in the heartbreaker "Leavin' This Life." "I'm really a happy person. But there's bad stuff along the way in life, no matter how happy it is," says McKenna, who speaks with a trace of Boston accent that disappears completely in the slightly lower-scaled and flinty twang of her singing voice. "My sister and I have talked about this so many times. We don't ever remember anyone like our dad sitting us down to tell us this, but there was like this mentality [in our family] of, ' It's never going to be fair and perfect so you just roll with it, you make it work no matter how it is, don't complain, and get it done.' "
Which means she doesn't think twice about having other members of her band use "her" bathroom on the bus. (Says Erelli, "You cannot even walk past her on the bus without her apologizing for being in your way, and it's her bus!") She doesn't break a sweat when a minor fender bender in the radio station parking lot slows down the busy schedule. (She later jokes about going onstage in a neck brace.) She doesn't pitch a fit, or even appear miffed, when, a short while later at the television appearance, there is no makeup person on hand when she was told there would be one. She's forgotten her makeup bag, but she improvises with help from her business manager and tour manager. Appraising her hastily assembled look in the mirror, she says, "I'm supposed to be a mom, right? I look like a mom." McKenna's magnanimity and even keel are legend in her circle of friends, none of whom fear her proximity to hearts of palm and fancy tour buses will transform her into a tantrum-throwing, brown M&M-disdaining glamour queen. "She dispels so many rock 'n' roll myths," says Mary Gauthier, a Boston-spawned singer-songwriter who passed McKenna's songs to a publisher, who in turn got them to Hill. "You don't have to be an [expletive], you don't have to be a mercenary, you don't have to step on people. She shows that you can be kind and a little older and have a family and still be a big success in the music business." McKenna is successful enough to have amassed a sizable following and three Boston Music Awards for her four previous indie releases. The rootsy bent of "Unglamorous" will likely be a relief for longtime fans worried McKenna would go for a slick, mainstream sound. Although coproducer McGraw admits there were some tweaks to be made for country radio, he still deems "Unglamorous" "left of center." "Everyone will be pleased," Chudnofsky says. "I think people were wondering if it was going to be like Bob Dylan Newport '65. 'Will Lori forsake us folkies?' "
While McKenna doesn't identify as a country artist -- or a folksinger for that matter -- the album neatly bridges the distance between Cambridge and Nashville in a way that should appeal to fans of everyone from Patty Griffin to the Dixie Chicks to Hill herself, who says, "I would've recorded every song on her album myself, but she needs to be heard." McKenna says she loves it and isn't worried about the commercial outcome. "I still feel like I have this strong support team in the label and in [co producer] Byron [Gallimore] and Tim and everybody that I'll be able to still do what I love to do." Right now she is loving this tour: performing, adjusting to the pace, and hanging out with Hill and their respective broods in the little area between their buses -- complete with lawn chairs, a ping-pong table, and basketball hoop. "It's been great," says McKenna, "It's gotten easier. My 3-year-old has calmed down a little bit now that we have a home base. I'm one of those moms that goes to a water park and if I don't have a place to put the diaper bag and the towels, I freak out. I need to know where my little spot in the world is." At 8 p.m. -- after a round of best wishes and handshakes from McGraw , who stops by backstage before the set -- McKenna's spot in the world is on top of what she refers to as "the wedding cake." With its multiple tiers, criss-crossing runways, intricate bits of instrumental ornamentation, and circular top platform, that's what the in-the-round set-up for "Soul2Soul" resembles. Large video screens provide views for all in the 12,000-strong crowd in the hulking Tacoma Dome. A mammoth lighting rig that would make Garth Brooks green with envy is poised to cast flattering colors on the first couple of contemporary country music. And, although they won't be illuminated until later in Hill's set, a quartet of mirror-ball chandeliers float in the air above the stage, occasionally catching light and throwing a sparkle onto McKenna. She is dwarfed by her surroundings but looks supremely comfortable, filling the dome with her lived-in voice, singing songs about people whose lives only seem small. As she prepares to deliver "Stealing Kisses," one of the songs that Hill nicked from her, McKenna asks the crowd a favor. "If you know the words, sing along so I can get a glimpse of what it's like when Tim and Faith get up here." Then, having gotten her glimpse, McKenna retreats to the bus. Her smallest children hurry to greet her. She smiles, the biggest smile she's shown all day.